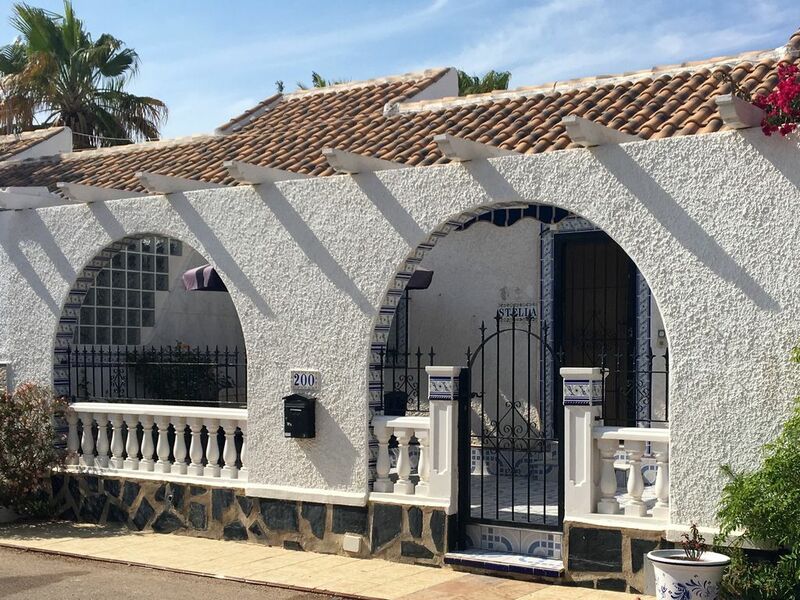 Casa Stella is situated in the Spanish town of Los Alcazares in the region of Murcia on the shores of the Mar Menor and is only a thirty minute drive from Murcia International airport and an hour from Alicante International airport. The coastal area is known as the Costa Calida (the warm coast) and enjoys on average, 320 days of sunshine per year. Our private house is ideal for those who want to avoid the hustle and bustle of a gated complex. There is no need for a pool with the beach being an honest ten minute walk away and the bars and restaurants set around the Plaza Mercadona are only a five minute stroll away. A car is not essential, as everything, including a good range of supermarkets, is on hand. Buses run frequently to the cities of Murcia and Cartagena, but if you would like to explore other places of interest, such as the beautiful Calblanque natural park or, further down the coast, Aguilas, then why not hire a car and discover for yourself what the area has to offer? Casa Stella is a spacious, well equipped 2 bedroom house, which comfortably accommodates four guests. There is an air-conditioning unit in the living room and a ceiling fan in each room. English TV and WiFi are provided at no extra charge. The house is South facing and there is a front terrace for al fresco dining, a small rear terrace and a large roof terrace/solarium equipped with loungers for those who like to just relax and enjoy the sun. Los Alcazares is a favoured holiday retreat for the Spaniards of Madrid and Murcia city, but also attracts visitors from Europe and Scandinavia. The pace of life is ‘tranquilo’ and although there are many restaurants and bars, there are no late-night clubs. Los Alcazares boasts three weekly markets, the nearest being the British Monday market, opposite Consum supermarket, the Tuesday market on the Rambla in Los Alcazares old town and the Saturday market on Avenida de Santiago de la Ribera. The Blue flag beaches stretch for 7km and are edged by a promenade which runs the whole length and is popular with walkers, joggers and cyclists alike. The Mar Menor is a large saltwater lagoon, separated from the Mediterranean Sea and renowned for its healing properties. It is shallow, warm and there are very few currents, making it a safe place to swim or to enjoy the varied water sports on offer. The old town is very traditionally Spanish and the restaurants there offer a wide range of tapas, menu del dia (set menu) and a la carte. The region is a golfer’s paradise with over 15 courses within easy driving distance, the nearest being Roda, which is only five minutes away by car. This apartment is right next to the 525 square so location is excellent , Geoff was a great host and the welcome package was a nice touch , roof terrace looks great but as the rain was with us for the 3 days we didn't get a chance to use it , would recommend. Thanks very much for taking the time to write a review. Glad everything was to your liking and hopefully see you back soon. Very well presented with everything necessary provided. Washing machine was a bonus. Both towels and beach towels provided which was a nice surprise. Location very convenient for supermarkets, the beach, and restaurants. Great base for visiting the wider Murcia area. Excellent location; near to Lidl supermarket, 5 minute walk to strip, 8 minutes to sea front, 10 minutes to The Arches pub and restaurants. Quiet and peaceful during our stay, although this was in September; taxi driver informed it was manic in this resort in July and August! We would stay again; easy information from hosts, Julie and Geoff. Glad you had a good time. Hope to see you and your family again! This property is wonderful. Its in a great location, and has everything we needed. The welcome pack left was a really nice gesture - thank you. The roof terrace was amazing. The down stairs terrace was a lovely spot to get out of the sun. The rest of the villa was very clean and comfortable. Geoff was so kind and helpful and his customer service was second to none. I am sure we will visit again. Thank you for your kind words and for taking the time to review our property. We are pleased that you enjoyed your stay and we look forward to welcoming you back to Casa Stella soon.